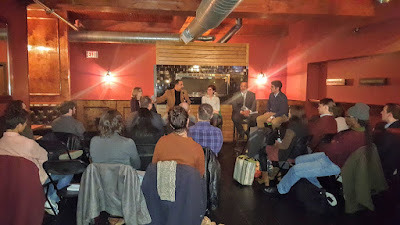 Young Involved Philadelphia sponsored a panel discussion on Democracy and the Democratic Party featuring my book Green Shoots of Democracy within the Philadelphia Democratic Party. The panel included prospective state representative Chris Rabb and reform-minded Democratic committeepersons Michael Bell and Moira Kulik. Chris Rabb’s analysis of his remarkable victory in the 200th PA House race was both an inspiration and a cautionary tale. He won against all the odds, but a whole lot of hard work and resources are necessary to take on the political establishment. Moira Kulik and Michael Bell are two of the committeepersons featured in my book and I greatly appreciated their willingness to speak candidly about their experiences in the ward system. Chris Rabb and I have had the good fortune to serve in 9th ward—where committeepersons vote on endorsements and procedures and where there is transparency about ward finances. Kulik and Bell are in the 36th ward, a closed ward where committeepeople have no say in endorsements and there is no transparency in finances. The sad news is that only 5 out of 69 wards consistently operate like the 9th. If I had landed in one of the undemocratic, closed wards, I wouldn’t have lasted 30 days, let alone 30 years. Unfortunately since my 2015 interviews with Bell and Kulik the situation in their ward appears to have deteriorated. There are no ward meetings, no GOTV plan, no political activity sponsored by the ward. The group they formed, the 36th ward progressives is no longer active although Bell and Kulik have some hope that it can be revived. The moderator Nick Marzano asked some interesting questions, one of which was: "What do you think keeps things from changing as quickly as some of us might like?" The best answer I could come up with is that institutional change is usually a slow process and people get worn down. Some of the people I interviewed in 2014 and 2015 who were all fired up and ready to go are no longer active in ward politics or considerably less active. However, others that I Interviewed are still working hard and committed to change; I have tremendous admiration for those who keep fighting the good fight. However, some of the people no longer active as committeepersons are not among the worn out and discouraged. Several of these committeepersons elected in 2014 have moved out of their divisions. These former committeepersons have to wait until 2018 if they would like to run for committeeperson in their new divisions. In the early 1990’s, the Democratic Party changed the term of committeepersons from two years to four years. This is especially problematic for young people who are often renters and more likely to move frequently than older committeepersons who are settled in a neighborhood. I checked with the City Commissioners’ Office and was told the length of term for committeepersons was completely up to the political parties—-no state action is required. Also the political parties do not have to do this in concert. The Republican Party could switch to a two year term even if the Democratic party decided to stay with 4 year terms. Maybe the Republican Party could lead the way here? I thought that it was an excellent discussion. I hope someone in a leadership position in my ward reads the summary and takes action. We need younger people to get involved and stay involved.